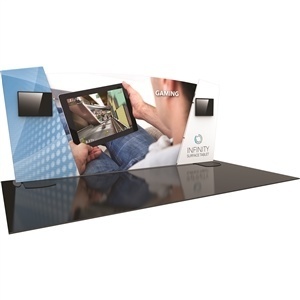 Are you looking to create a dynamic visual presentation at every trade show? 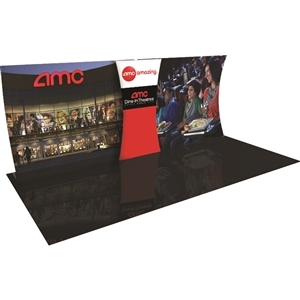 A 10’ x 20’ Formulate trade show display will provide the “big show presence” that will capture the attention of customers and prospects. These expansive tension fabric exhibits feature vibrant, full-color graphics and smooth, clean lines that will stand out on a crowded venue floor. APG Exhibits is your one-stop headquarters for a large selection of Formulate displays at affordable prices. We feature an assortment of 10x10 and 10x20 Formulate trade show display booths that will enable you to stand out from a crowded field at every event. Many of these Formulate trade show displays come as all-inclusive kits containing hardware and tension fabric graphics, along with additional features such as lights, shelving and a wide range of customizable options. Step-by-step instructions are also included for fast and easy setup. Who Can Benefit From Formulate Products? With more than 130 Formulate trade show displays from which to choose, we can meet the needs of everyone from Fortune 500 companies to small business owners who need to get the biggest bang in return for their marketing buck. Formulate products are the preferred choice of event coordinators, trade show managers, marketing professionals, retail store owners/managers and anyone else looking to make a lasting impact and maximize their return on investment. 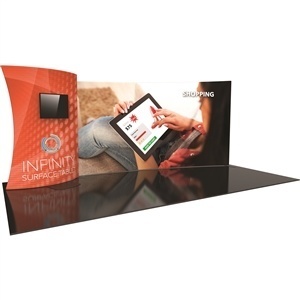 There’s an attractive Formulate trade show display for every need and price range. 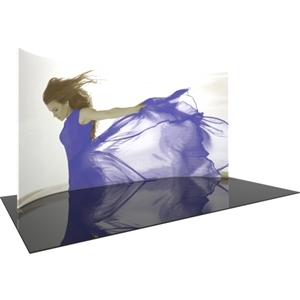 Our more popular Formulate products include the 8S, a straight backwall tension fabric exhibit that comes with two LED lights for heightened visibility and beautiful dye-sublimated pillow case graphics that allows you to make a bold marketing statement. You’ll also find innovative table top displays like the Formulate TT3, the perfect choice for capturing attention in smaller venues and includes a snap-together aluminum frame for simplified assembly. When you choose a Formulate trade show display from APG Exhibits, you receive exceptional service and support every step of the way. With our more than 30 years of experience, we understand what it takes to make your booth the “featured attraction” at any trade show or promotional event. Our premium services include custom graphic designing that will enable you to display your brand or deliver your unique marketing message in style. We also provide complete project management services that will remove the burden from your shoulders and make your job so much easier. High-Quality Displays at Affordable Prices: That’s How We Do It at APG Exhibits! At APG Exhibits, we recognize that a trade show exhibit can represent a significant investment for any company. That’s why we strive to make our products as budget-friendly as possible. Our Low Price Guarantee ensures you’ll get the lowest available price on your Formulate display — if you find the same product at a lower price from one of our online competitors, we will beat that price. And you’ll want to check out our special promotions page for even more money-saving deals and offers. 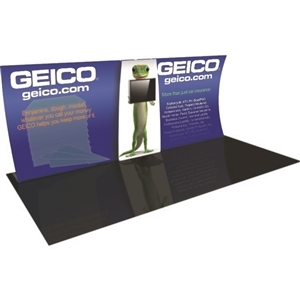 If you are looking for a premium tension fabric display product, the attractive Formulate Designer Series 10 X 20 trade show booth is sure to meet your needs. 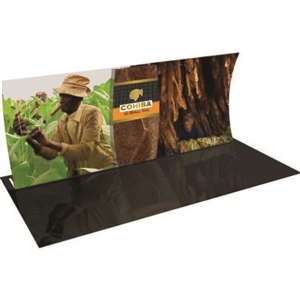 Available in 10-foot, 20-foot and 30-foot sizes, these displays feature pillowcase fabric graphics that you set up simply by pulling them over the sturdy aluminum tube frame. They also include wheel transit cases for easy portability on the floor or when traveling to or from an event. You don't have to let a lack of floor space prevent you from capturing the attention of prospects at trade show events or other large gatherings. These compact displays can provide the ideal solution when space is limited. They can also offer a cost-effective alternative to larger, bulkier display pieces, while adding the benefit of portability. Choose from a wide assortment of straight and curved horizontal and vertical displays that come as complete kits containing hardware and graphics. Formulate Accents and Connectors: These stylish accents and connectors can provide a noticeable enhancement to your display and dramatically increase its visual appeal. They can also improve your display's functionality by increasing messaging capacity. As with all of our Formulate tension fabric display products, you have ample opportunities to customize your accents and connectors to suit your tastes. At APG Exhibits, we do much more than just sell top-quality display products. As an e-commerce display and signage provider with a major marketing agency pedigree, we bring a unique perspective to the trade show display design process. Our experienced staff will work closely with you to help you choose and develop the best promotional product that will maximize your return on investment. Our standardized and modernized production pipeline and comprehensive project-management services ensures a fast, error-free completion of your project, regardless of size or scope. Our unique Low Price Guarantee ensures you will always get maximum value and help you stretch your marketing budget to the fullest. If you find a lower price for any qualified product offered by an online competitor, we promise to match that price. Just look for the Low Price Guarantee badge below the price on individual product pages to ensure the product is eligible for the guarantee. If you have any questions about which of these Formulate displays would be the right fit for your needs, please call, email or start a live chat with us! If you can't find the right product on our website, just let us know – we also have a number of products that aren't listed on our site.